Previously, we have written blog about how to deploy your MVC to shared hosting environment. In this tutorial, we will be more focusing on above error message. 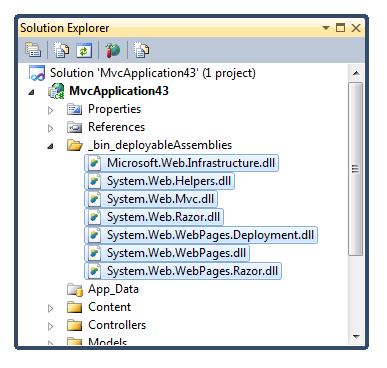 There are a few ways to automatically deploy the 'Microsoft.Web.Infrastructure.dll' component library with your application. The steps depend on which version of Visual Studio you are using. 2. When deploying for MVC, only choose the first option. Never mind the second option even though it says "Razor syntax." The second option is for deploying the required libraries for projects officially known today as ASP.NET Web Pages. Once you click OK, you'll see a new folder appear in your project called _bin_deployableAssemblies with the required libraries. This is a secondary bin folder for framework dependencies. If you right-click on any one of the .dll's shown in this folder, you'll see that the libraries are set to "Copy to Output Directory". When the application is packaged/deployed, the libraries (and the folder) are also copied. Again, the framework will also automatically check this folder for dependencies. For .NET, any folder that begins with an underscore ("_") is considered private and non-accessible to the browser. Therefore, you can rest knowing that the dependencies are secure. After Visual Studio 2010, the "Add Deployable Assemblies" option was removed from the project's options menu. The system libraries are automatically copied to the Bin folder of your project. However, again, the 'Microsoft.Web.Infrastructure.dll' is only available on machines that have Visual Studio installed. So how do you deploy this library with you application if you don't want to install Visual Studio on a production environment? I'm glad you asked. You'll need to use the Package Manager. 1. Run the following command in the package manager (if you're not familiar with Visual Studio, this can be reached by going to "Tools --> Library Package Manager --> Package Manager Console" in the top menu). 3. You will see then see a message indicating that it has been installed and added to your project. 4. You'll also see that 'Microsoft.Web.Infrastructure.dll' has been added as a reference in your References folder. 5. Finally, now, when you deploy your application, 'Microsoft.Web.Infrastructure.dll' will be included in the Bin folder. Make sure the Pipeline mode of IIS Application pool is "Integrated"
Check UrlRoutingModule-4.0 is added in the modules of that website. In most cases of HTTP Error 403.14, or 404, above are the possible causes and fixes. The email field needs to be optional but any address entered must be valid. If a validation error occurs, it should replace the optional label with the error message. Behind the scenes I’m using Data Annotations to validate the email address, so any errors will be passed into the ModelState. ASP.NET MVC 6 has built-in support for showing these errors (using the ValidateMessageFor helper) so it’s easy to write a wrapper around that, supplying the ‘optional’ text as a parameter.